Business Systems Analysis | RTC Group, Inc.
RTC has successfully performed Business Systems Gap Analysis for a number of retailers throughout the years. This process, although appearing cumbersome and time consuming, is the key to success in implementing new business solutions. All of RTC's customers who have gone through this process have been amazed by the results that have been achieved. In many cases the up-front comprehensive Business Systems Analysis has enabled us to help our clients leverage their negotiations with solution providers and save our clients hundreds of thousands of dollars in their overall project expenditure. 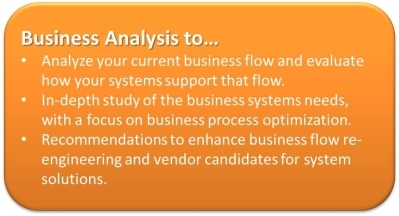 This type of detailed comprehensive Business Systems Analysis can take anywhere from 4 to 10 weeks. The difference between a 4 to 5 week analysis and a 10-week analysis is the level of detail that can be covered on each specific subject, all of which are important to your business success. As part of our diligence in this process, it is common for RTC to also review business practices and standard audit points throughout the business cycle. As a direct result of this process, you will be better suited to understand the difference between your business systems needs and the business systems offerings provided by the vendor community. It is extremely important to understand that this process can either be done in advance of the solution selection process or done after vendors have been selected and contractual commitments are made. As part of RTC's ongoing success in automating retailers throughout the country, we have learned to educate our customers on how to help them help themselves. Below is a list of key bullets that we feel greatly increase the success factor for us all. •Departmental participation is key as we have a limited time engagement. •The retailer should establish a formal Executive Steering Committee for key decisions. •The retailer should establish a formal Retail Projects Steering Committee for project decisions. •Re-engineering a retail business requires extensive professional guidance and training. •All defined projects should include ROI justifications. •Results management is not just a focus, rather a quantitative measured focus.